How can you create an authentic learning environment—one where students ask questions, do research, and explore subjects that fascinate them—in today's standards-driven atmosphere? Author Larissa Pahomov offers insightful answers based on her experience as a classroom teacher at the Science Leadership Academy, a public high school in Philadelphia that offers a rigorous college-prep curriculum and boasts a 99 percent graduation rate. Pahomov outlines a framework for learning structured around five core values: inquiry, research, collaboration, presentation, and reflection. A detailed description of how the value can transform classroom practice and how a "digital connection" can enhance its application. A step-by-step outline for how to implement the value, with examples from teachers in all subject areas. Solutions to possible challenges and roadblocks that teachers may experience. Suggestions for how to expand the value beyond the classroom to schoolwide practice. Anecdotes from students, offering their perspectives on how they experienced the value in the classroom and after graduation. The framework is a guide, not a prescription, and middle and high school teachers—individually or as a team—can use it to structure whatever content and skills their current school or district requires. The book also includes suggestions for how to integrate technology into inquiry-based education, but the principles and approaches it describes can be applied successfully even in places without abundant technology. Both practical and inspiring, Authentic Learning in the Digital Age is an indispensable handbook for reinvigorating teaching and learning in a new era. 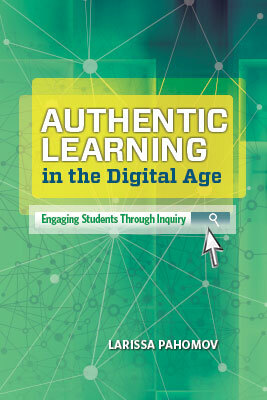 "Thoroughly 'reader friendly', Authentic Learning in the Digital Age: Engaging Students Through Inquiry is exceptionally well written, organized and presented. It is very highly recommended for novice classroom instructors and has a great deal of practical valued for even the more experienced teacher." "The book has many useful ways for teachers to gain insight, whether through the student perspectives or the specific feedback from teachers." LARISSA PAHOMOV teaches students English and Journalism at the Science Leadership Academy in Philadelphia, an inquiry-driven, project-based, 1:1 laptop school considered to be one of the pioneers of the School 2.0 movement. Pahomov has been published in NCTE's English Journal and is a contributor to the National Writing Project's Digital Is website. She lives in West Philadelphia with her husband.